Beaver numbers on my Southern trapline exceeded nuisance proportions long ago, and I’ve been doing control work on them for many years now. But I can tell you unequivocally that Mother Nature, with a two-year drought that ran from 2007 through 2008, took a much greater toll than I ever could. If a beaver has no water, it has no home. There were still a few beavers about causing problems last season, and the clients wanted them removed, but my overall catch was off about 60 percent. I estimated the local population was down to about a third of what it had been before the drought. And of the beavers that remained, a high proportion were what I call “educated.” They might also be called trap-shy, and more. Trappers have long observed that when animal populations decrease, individual can be harder to catch. I think you can attribute this to reduced competition for food, shelter, and mates. Suppose you enter an orchard and the first tree you come to has one apple way up at the top. Do you climb that tree to get that apple? Not likely. You probably go to the next tree or the next or the next, until you find an apple that is easier to reach. Now, suppose you come to the same orchard, but this time, there is a crowd of people milling around with sacks looking for apples. You spot that same apple, and chances are you go straight after it before someone else does. Who knows? It may be the only apple left. I believe that’s the way animals react, too. When there are more animals competing for a resource, the individual animals may be willing to assume more risk to get some, which makes those animals easier to trap. Also, in the case of my Southern beaver line, there was a preponderance of experienced adults because more youngsters had perished in the drought. Most of the old-timers already knew traps. I think the low water also had the beavers on edge. Their habitat had been significantly reduced, and they were hypersensitive to changes in a smaller world—changes like my trap sets. The first place I trapped had held beavers almost every year, and I found fresh sign, though not much. I set a 330 below the dam. The first day it was fired but empty, so I reset it. When it was again fired and empty the second day, I figured I had a smart beaver on my hands, one I probably wasn’t going to catch with a bodygrip trap. The dam wasn’t tall, but it extended a ways out through the swamp, and about 10 yards from the spillway, a small tree growing on the dam had been clipped off by a beaver. Maybe 12 inches directly out in the pond, there was another little stump. This gap made a nice “force” location, and I decided to exploit it with a set. About 3 feet on either side of the stumps, I kicked holes in the dam so the water would escape. Then I hung a snare right between the stumps. I figured when the beaver came to fix the breaks, it would patch one and then go directly to the next one by the shortest route, passing between the stumps. When I came back the next day, both breaks were repaired and the snare was no longer hanging. Upon closer investigation, I found the loop pulled down to about 3 inches, with some beaver hair in it. The beaver had escaped, and judging from the small loop it had left, it must have been held, albeit briefly, by the neck. When a beaver feels a snare tightening around its neck, it may stop and use its front paws to force the snare back off over its head. This is why I generally set snares to try to catch a beaver with at least one front leg through the loop. Caught that way, they can’t slip out. That’s how I had set this snare, though obviously it hadn’t worked. I remade the set but didn’t hold much hope, as the beaver would surely avoid it, now. Most of the water in the beaver pond was too shallow to drown a beaver in a foothold trap, but I did find a pool near the dam and made a castor mound set on the bank, rigged the trap on a slide wire, and then tossed the weighted drowning sack out in this deeper water. I kicked open the holes in the dam before leaving. The next day, the breaks in the dam were repaired, the snare was still hanging between the stumps, and there was a beaver in the foothold. I collected my catch, remade the set, opened the dam holes again, and kicked an additional hole in the dam at the spillway. The next day, all of the holes were patched, and none of the sets had been disturbed. We played this game for a few more days. Even though the break at the spillway was just a few feet from the remade castor mound, the beaver had nothing to do with it. Sometimes just moving a set helps, but this was the only place deep enough to drown a beaver, so I couldn’t do that. Instead, I cut a fresh willow and turned the castor mound into a feed set with food lure. That didn’t work, either. The beaver would come, patch all of the holes in the dam, and ignore all of the sets. It didn’t even fire the 330 anymore. 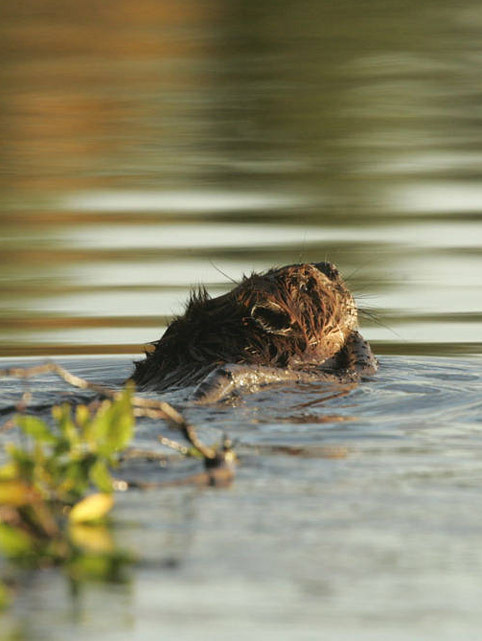 Setting a trap right in a dam break can work, but often as not, the trap gets fired but misses the beaver. This happens because the beaver is usually bringing some material to fix the dam, and that stuff is usually held in its front paws, where it hits the trap before the beaver has a chance to step in the trap. Paul Dobbins came up with a set just for this situation, a set that works better than most, and I’ve modified it a bit to better suit my purposes. I don’t set the trap right in the break in the dam. Instead, I bed it about 18 inches out from the break, with the precise location determined by the contour of the dam. I measure by putting my elbow against the dam on the deep-water side and reaching out with my fingers. Where fingers touch water, that’s where the trap goes. Then I dig more of a hole than a bed for the trap, such that the trap will be setting deeply enough to miss any patching material the beaver may be carrying in its front paws. Then I use four pegs to make sure the trap stays in place, one in each corner where the jaws and the coilspring levers meet. These pegs are about 3/4-inch diameter and long enough to hold fairly well when shoved in the bottom mud. I like the pegs to stick up an inch above the trap. The pegs don’t interfere with the trap, and the set targets a back-foot catch. If the beaver is incoming, it may hit the pegs on the outside of the trap with its patching material and raise up to get the load over the pegs. Then, hopefully, it will step in the trap with a back foot. If the beaver steps over the trap, the front pegs should keep it from kicking the trap out of the way, and I will have a chance to catch it on the next trip. I made this set, and the next day, the hole in the dam was not repaired, and the trap was missing from its bed. I pulled on the drowning cable with high hopes, but to my dismay, I found the trap just a few feet away, tangled around a stub I had not noticed underwater. The beaver had hung up before getting in deep enough to drown and then pulled out of the trap. This beaver wasn’t just smart, it was lucky, too. That was the end of our game. I left the sets in and the dam broken, but the beaver didn’t return. About a week later, I was checking a bodygrip in a channel at another beaver pond, about a half-mile away. I hadn’t made a catch there for a week, and I was going to pull the set. Lo and behold, there was a beaver in the trap. And the beaver had a fresh mark on its foot. I can’t say for sure it was the same beaver that had escaped at the other dam, but I bet it was. You may remember that this little story began with the beaver setting off a bodygrip without getting caught. But it had rained the day before, and the water was so muddy I don’t think the beaver saw this trap before hitting the trigger wires. Guess its luck finally ran out. I dealt with another smart beaver not too far from there, and I was partially responsible for educating this one. I had set a foothold trap at a blocked road culvert, and because it was set next to the road and I was afraid it might be stolen, I had used a smaller, less expensive trap. On the first check, the trap was fired but buried in the bottom debris. Evidently, it hadn’t been quite big enough to nab this beaver. I made a castor mound a few feet away and caught a beaver. But I didn’t think it was the big one I had missed. Every day, I’d tear a hole in the blockage at the culvert, and the beaver would patch it. I tried a modified dam-break set, but that didn’t work. The beaver just kept burying the trap in debris and also ignoring the castor mound up on the bank. We played our cat-and-mouse game for another week. Finally, I put some fresh mud and lure on the castor mound, and the next day, the trap held a big beaver, the one I believe was clogging the culvert. I tangled with one other notable specimen on this particular line, a beaver that inhabited an oxbow lake just off the river. This one was not only trap-shy, it was also aggressive. I caught a beaver in a snare in the drain going to the river and found it dead in shallow water. When I skinned it, I could tell from the wounds it had been killed by another beaver. I also caught a few more beavers in lethal sets there, and all exhibited bite marks that had been inflicted after they were dead. The bad beaver would actually get out of the water and walk around a 330 in a channel. I tried snares, but it walked around those, too. I also had a cat set nearby, about 10 feet off shore beside a slack-water pool. I took three cats from the set. On the last trip through, I noticed where a beaver had swum across the slack water, climbed out on the bank, and checked out the cat set. No, I didn’t catch the beaver in the cat set. As a matter of fact, I never did catch that bad beaver.